The balanced blend of all the nutrients helps in reducing exercise-induced muscle damage. 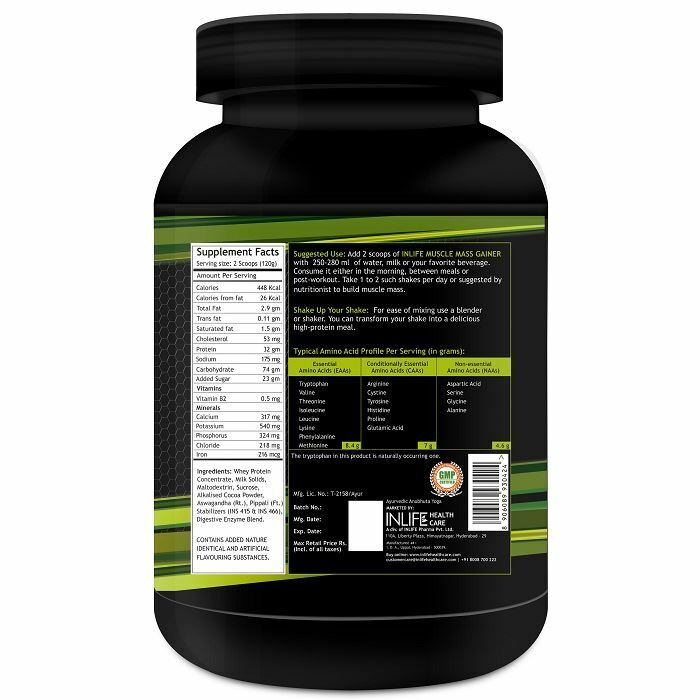 Helps in enhancing protein synthesis and speeding up recovery for greater gain in fat-free muscle mass. Helping to put the body into an anabolic state. Supplies a massive leucine and BCAAs. Chocolate flavoured mass gainer protein is versatile in making protein shakes, smoothies and recipes. Key Ingredients Whey protein concentrate, skimmed milk powder, maltodextrin, sucrose, asvagandha, pippali, alkalised cocoa powder, gum blend (xanthan and cellulose), digestive enzymes blend, nature identical and artificial flavours. 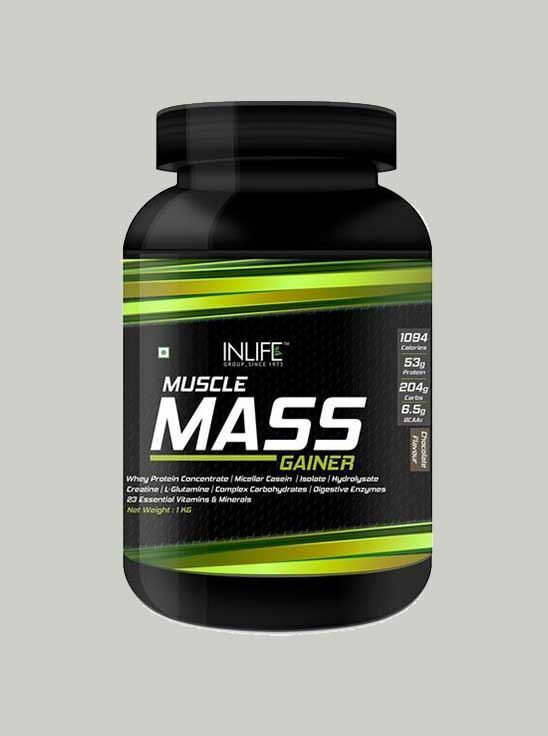 INLIFE Muscle Mass Gainer is a definitive, powerful and scientifically superior product that will assist you in building a desirable physique. Each pack contains Whey Protein Concentrate, Micellar Casein, Whey Protein Isolate, Whey Protein Hydrolysate, Creatine, L Glutamine, Complex Carbohydrates, Digestive Enzymes and 23 essential vitamins & minerals that boots muscle mass and stays with you to craft the best body you can. Our product contains high-quality protein and non-fat calories from specially processed complex carbohydrates provide sustained release of energy for muscle building. The balanced blend of all the nutrients helps in reducing exercise-induced muscle damage. It also helps in enhancing protein synthesis and speeding up recovery for greater gain in fat-free muscle mass. Our product supplies carbohydrates when mixed with two cups of skimmed milk through a multi-phase carb complex and promote muscle glycogen replenishment, helping to put the body into an anabolic state. Our protein does supply a massive leucine and BCAAs when mixed with two cups of skim milk, which helps in driving rapid mass and strength gains. 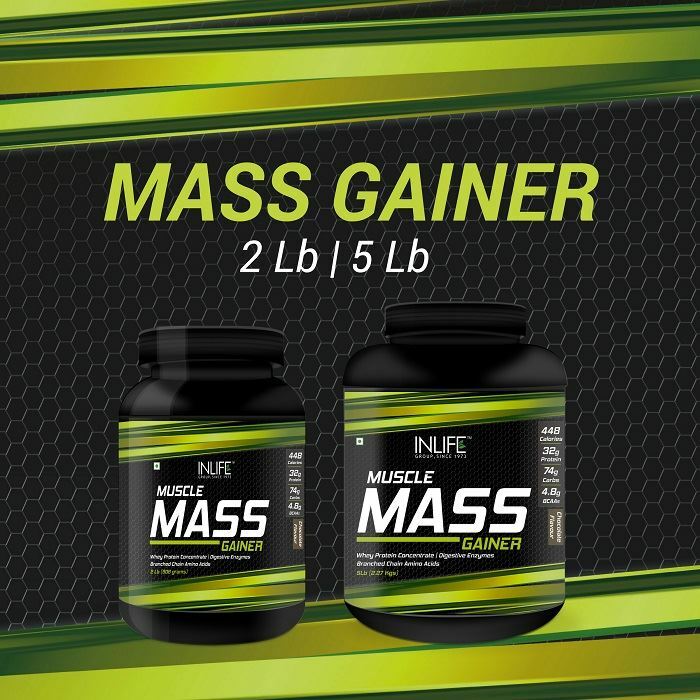 Chocolate flavored mass gainer protein is versatile in making protein shakes, smoothies and recipes. 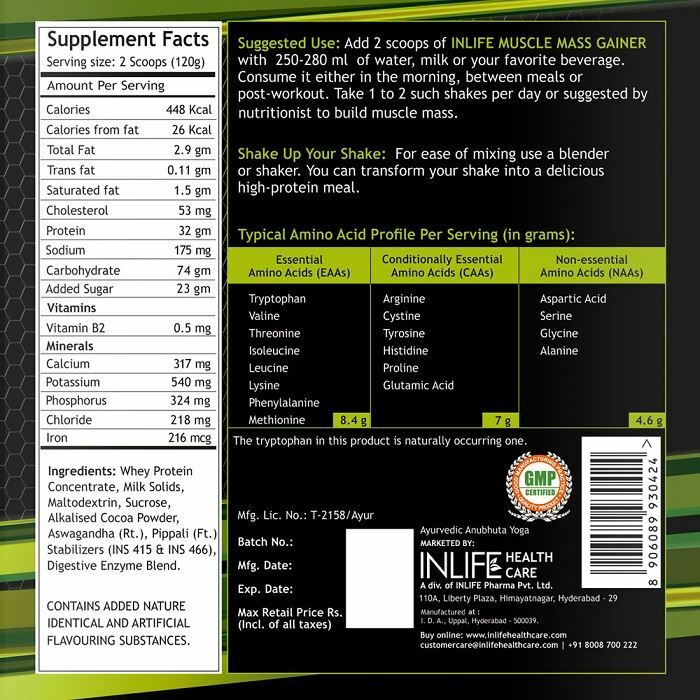 Boost calories and nutrition by adding INLIFE Muscle Mass Gainer to protein bars, cookies, and savory recipes. 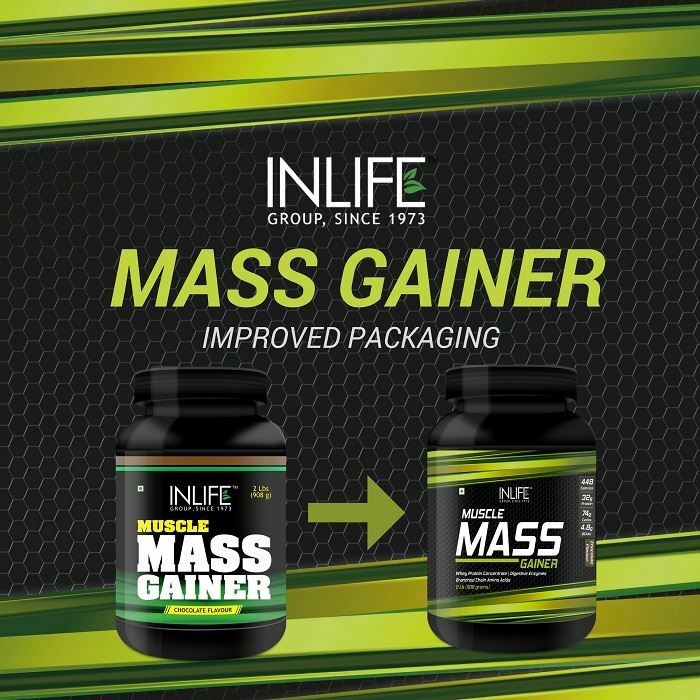 Add 4 scoops of INLIFE Muscle Mass Gainer with 12-15 oz of water, milk or your favourite beverage. Consume it either in the morning, between meals or post-workout. If preferred consume half serving twice daily. Additional serving may be taken depending on individual caloric and nutrition requirement.